Kenyan fishermen on Lake Victoria use special nets to conserve dwindling fish stock. 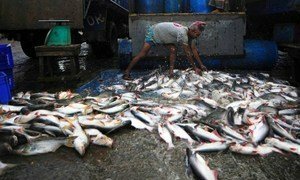 A new report out today from the United Nations Food and Agriculture Organization (FAO) shows that while growth in aquaculture has helped drive global per capita fish consumption above 20 kilograms a year for the first time, almost a third of commercial fish stocks are now overharvested at biologically unsustainable levels. The latest edition of the agency’s State of World Fisheries and Aquaculture report attributes stronger aquaculture supply and firm demand, record hauls for some key species and reduced wastage as some of the reasons for the increased consumption. It also notes that despite notable progress in some areas, the state of the world's marine resources has not improved. The sector's global production rose to 73.8 million tonnes in 2014, a third of which comprised molluscs, crustaceans and other non-fish animals. It is important to note that in terms of food security and environmental sustainability, about half of the world's aquaculture production of animals such as shellfish and carp, and plants, including seaweeds and microalgae, came from non-fed species. Decreased fish landings have been observed in some regions due to the implementation of effective management regulations, like in the Northwest Atlantic, where the annual catch is less than half the level of the early 1970s. Halibut, flounder and haddock species in that area are showing signs of recovery but this is not yet the case for cod, according to FAO. The United Nations Food and Agriculture Organization (FAO) has announced that a groundbreaking international accord aimed at stamping out illegal fishing went into effect today and is now legally binding for the 29 countries and a regional organization that have adhered to it.